Nine American soldiers were killed in the first two days of a new American drive to kill al Qaeda in Iraq fighters holed up in districts north of the capital, the U.S. military reported Wednesday. The two deadly attacks came as many militants fled American and Iraqi forces massing in Diyala, a province of palm and citrus groves that has defied the trend toward lower violence. The campaign's scope is nationwide but is mostly focused on gaining control of the province and its most important city, Baqouba, which al Qaeda has declared the capital of its self-styled Islamic caliphate. 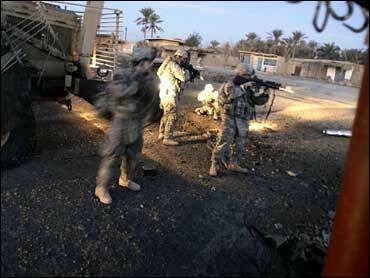 Six soldiers were killed and four were wounded Wednesday in a booby-trapped house in Diyala. The military also announced that three U.S. soldiers were killed and two were wounded in an attack Tuesday in Salahuddin province, north of Diyala. All indications are that the al Qaeda fighters retreated north from Diyala, presumably to Salahuddin, before the current operation began Tuesday, said the top U.S. commander in northern Iraq, Maj. Gen. Mark P. Hertling. "Operational security in Iraq is a problem," Hertling said Wednesday, noting that the Iraqi army uses unsecured cell phones and radios. "I'm sure there is active leaking of communication." Only Baghdad province has been deadlier than Diyala the past two years, according to an Associated Press count. And while violence has declined over the past six months in Baghdad and many other places in Iraq, much of Diyala has remained a killing field. At least 273 civilians were slain in Diyala last month, compared to 213 in June. Over the same span, monthly civilian deaths in Baghdad dropped from 838 to 182. The reason for the surge of bloodshed is that insurgents who were pushed out of the western province of Anbar and out of Baghdad shifted their operations into Diyala, U.S. commanders say. Still, the tree-lined farm region is more difficult terrain for fighting insurgents than the desert of Anbar, suggesting Diyala may not have seen the last of al Qaeda in Iraq. Compounding the difficulty for the military is the checkerboard pattern of Shiite and Sunni communities adjacent to one another. The military will need a period of peace and stability to meet its goal of speeding up work on basic services and other civic projects that commanders believe will win more allies for the American effort. First, U.S. and Iraqi forces will try to clear areas of insurgents. Iraqi police will then move in to establish some law and order. Finally, the "Awakening Groups" or "Concerned Local Citizens" - mostly Sunni fighters who have joined the Americans in battling al Qaeda - will be relied upon to maintain stability after troops move on. It is these Awakening Groups that are al Qaeda's bulls-eye of the moment. The terror group, perhaps spurred by Osama bin Laden's audio message late last year, has been carrying out suicide strikes on civilians who have sided with the Americans against al Qaeda in Iraq. There have been other types of attacks as well. Hertling showed a video taken by a U.S. drone showing militants in Diyala dragging a man from the trunk of a car, throwing him into a ditch and then shooting him. Asked about the timing of the U.S. operation, Hertling said the answer was simple. "Why now? Because we can. Baghdad is more secure. Anbar is more secure," he said. "Why now? Because ... the enemy has moved into these (northern) provinces." Hertling said that in his area of control - Diyala, Salahuddin, Kirkuk and Nineveh provinces - 24,000 American soldiers, 50,000 members of the Iraq army and 80,000 Iraqi police are taking part in the offensive against al Qaeda in Iraq. "There are more U.S. and Iraqi security forces in Diyala now than there ever has been," he said. "We're attempting to increase the tempo of operations in that specific province." Hertling said his troops had killed 20 to 30 insurgents so far. Meanwhile, in Kirkuk, 180 miles north of Baghdad, a pair of nearly simultaneous car bombings damaged two Christian churches and wounded two people, according to a senior police officer there. Brig. Sarhat Qadir said the bombings at the Chaldean church of the Heart of Jesus and the Assyrian church of Mar Afram took place within 10 minutes of each other. The two churches, about 700 yards apart, were empty at the time of the attacks, which came after a series of bombings Sunday targeted three churches in Mosul, 225 miles northwest of Baghdad. No one was hurt in those attacks. Iraqi Prime Minister Nouri al-Maliki, a Shiite, told the Vatican's ambassador to Iraq on Tuesday that his government was working to ensure the safety of Christians in the country. Christians, who make up about 3 percent of Iraq's estimated 26 million people, have been frequent targets of attacks by militants since the 2003 U.S.-led invasion. Many have fled to neighboring countries. A handful of U.S. reconstruction team leaders based in Iraqi provinces have given President Bush mixed reviews on political success in the country. While some report success, many problems remain - a lot of them with Iraq's central government.